What with airport queues, checking in bags, charges for bringing equipment, airport transfers and all the rest, travelling to your chosen ski resort can sometimes be a logistical nightmare. We’ve put together this guide of top travel tips for skiers to help you navigate this minefield so that you can relax into holiday mode before you even arrive here in Meribel. A vital way of making sure the journey to your chosen ski resort is as hassle-free as possible is to make sure that you pack light. Of course you need to make sure you pack all the essentials on your skiing checklist such as warm clothing, sun-cream, goggles and lip balm, but you can mitigate problems in your journey to resort by making sure you don’t go over your luggage allowance. We recommend weighing your bags and checking your airline’s luggage allowances before you leave home. We advise (certainly for your first ski trip) that you opt to hire your ski equipment here in Meribel. When you hire ski equipment, the ski hire shop has a duty to keep the kit in the best condition so you’re always going to have the best quality gear. We strongly advise you to order your ski equipment prior to your holiday to maximise your all-important ski time, and to ensure that you get the cheapest deals. Depending on the carrier, ski carriage can sometimes cost up to £150 extra (each way), so renting ski equipment in resort is a great option for people looking to save on unnecessary additional flight charges. This too goes for transfers. *Top Travel Tip! If you can, wear your bulkiest clothes and save the light layers for your bag. Use compression bags to condense bulky items such as fleeces to save packing space. And always roll your clothes to save bag space too! When booking a holiday in Meribel it will help you navigate the tricky logistics of getting to resort if you book with a chalet company like Ski Basics who are on hand to offer their expertise and top travel tips for skiers arriving in resort. We’re here to make your life easier! Not only will you get to experience the beautiful well-located chalets, impeccable service and delicious food when staying at a Ski Basics chalet, but we take care of all the details so you can enjoy a stress-free ski holiday with real flexibility and an affordable price tag. We offer the simplicity of group bookings, airport transfers, ski fitting and passes organised before you arrive. From suggesting the best board jump spots, routes around The Three Valleys to recommending a bar for the evening’s festivities, we can help take the headache out of your travel to Meribel letting you enjoy the ride. Not only that, but our log-in personalised booking pages can be accessed by all members of your party to take the pain out of paying, organising transfers, your ski hire and passes. When travelling to the Alps from the UK or Ireland by air, there are four airports within easy transfer distance to Meribel (see below) and we advise using Sky Scanner for great comparisons on flight tariffs. Take a look at our Travel page to see more about which airlines fly to the Alpine airports mentioned above to help you find the closest airport to home. Benefit of Air Travel – Travelling by air is quick and relatively hassle-free (as long as you note the packing advice above!) and probably the most popular way our guests travel to Meribel for their ski holiday. The Eurostar runs directly from London St Pancras and Ashford International to the town of Moutiers, which is only 25 minutes drive from Meribel. You can have a look at the Eurostar ski-train timetable and book online at www.eurostar.com. The train that leaves London on Friday evening arrives early Saturday morning in Moutiers. When you arrive in Moutiers you will be met by a Ski Basics driver who will take you to a café in Meribel for breakfast. Your Chalet manager will greet you there and arrange ski passes and ski hire while you enjoy some hot tea and coffee and breakfast before hitting the slopes! Benefit of Train Travel – There are no weight restrictions on Eurostar or European trains, nor charges for ski or snowboard bags, so there’s no need to worry about condensing gear. Additionally, food and drink can be brought on board – to turn the journey into a moving feast! Self-driving to Meribel is an option favoured by many, especially those looking for a little flexibility. The resort is approximately 600 miles from the channel ports and is conveniently served by motorway to within 12 miles of the resort. Toll costs are approximately £45 each way. Channel crossings can be booked online with either Eurotunnel or P&O Ferries. Benefit of Car Travel – Self-drive holidays to the Alps are great value, put the traveller in charge and can be great fun. The cost of travelling with a family of four in a car via Eurotunnel Le Shuttle is roughly equivalent to just one of you flying – even after petrol and toll costs. If you fit a roof box you can fit even more stuff in, and enjoy all of those amazingly breath-taking views along the way, stopping as you please. 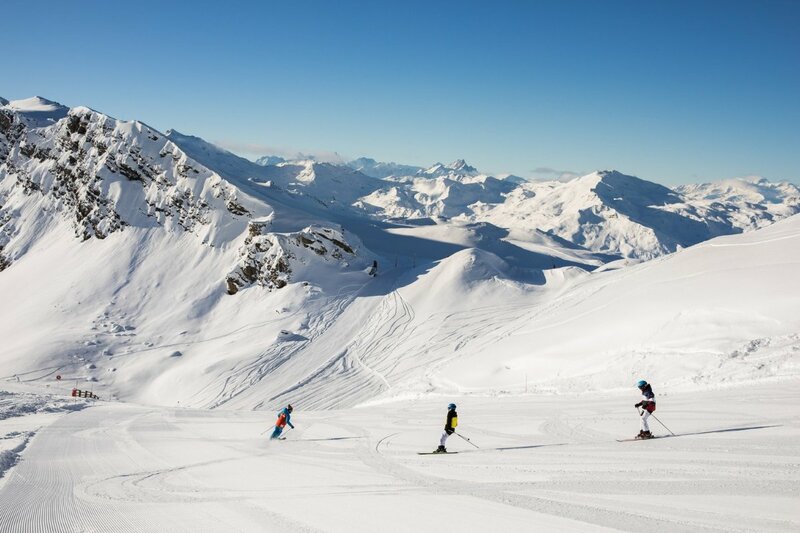 Our top travel tip for skiers is relax and let us do the hard work… We are passionate about great skiing, know The Three Valleys inside out and are here to help you enjoy the slopes to make the most of what this magical place has to offer. When you book with Ski Basics we’re on hand to offer you the advice and guidance you need to make travelling to the Alps as stress-free as possible. Hopefully rather than spending your time worrying about the details, these travel tips for skiers will make you ready to kick back and enjoy your time on the slopes. Share your top travel tips for skiers with us over on Facebook, Twitter and Instagram!